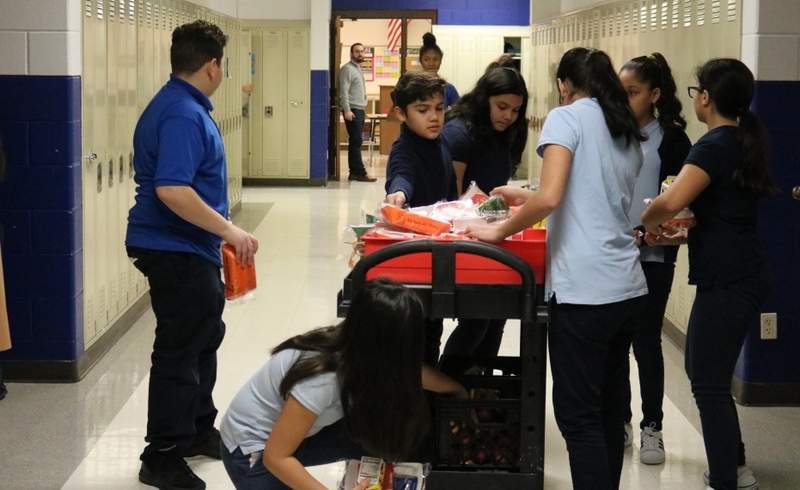 Students at Lincoln Middle School pick up cereal and fruit for breakfast. It’s 8:20 a.m. at Lincoln Middle School in Berwyn, and a legion of school breakfast carts are rolling out. Each cart is stocked with packets of cereal, fresh fruit and milk. Principal Michelle Smith walks alongside one of the carts as it rolls to a stop outside a classroom. “We’d have an uprising on our hands if we stopped offering breakfast for students like this,” she jokes. Students grab a meal from the cart before returning to class. This is the first year Lincoln Middle School is offering a “Breakfast After the Bell” meal option. Instead of offering breakfast before the school day starts – which limits availability and can unintentionally stigmatize participation – staff bring food to students at the beginning of their day. Students eat in the classroom during attendance and morning announcements. The change arrives as a new law took effect at the beginning of the 2017-2018 school year. Across Illinois, breakfast is now a part of the school day in low-income schools. Greater Chicago Food Depository volunteers, partner agencies and staff advocated for the law in May 2016 during the annual Lobby Day trip to Springfield. Governor Rauner signed the bill into law that July. At Lincoln Middle School, the difference has been staggering. Between the dramatic increase in participation, and the fact that 88 percent of Lincoln students are eligible for free or reduced-price meals, the need is clear. “Without the breakfast in the classroom, we would see students eating a lot more unhealthy food,” Smith said. So far, reception from the school’s faculty has been positive. Teachers report that students have more energy to start the day. There’s also been a welcome, unintended consequence. Lincoln is just one of hundreds of schools across the state that are implementing Breakfast After the Bell. Overall, more than 175,000 students are expected to gain access to breakfast because of the legislation. With a nutritious breakfast, students are better prepared to focus and learn each day.